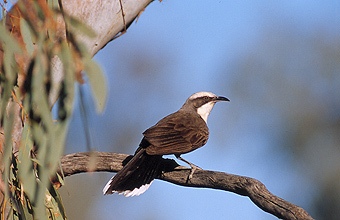 Grey-crowned Babbler is a lousy name. When I was young and only had Cayley's "What Bird is That?" to go by, I didn't know how to tell Grey-crowned from White-browed Babblers. I lived in Sydney so they weren't birds I got to see too often. No mention was made of the rufous wing patches (see pics # 443202 and 443203). They would be better known as Rufous-winged Babbler. 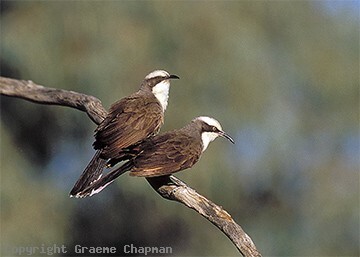 Grey-crowned Babblers and also many other woodland birds are declining and under threat in SE Australia (particularly in Victoria) where intensive agriculture and farming have brought about great changes to the landscape. Their favourite habitats are open woodlands, usually those with a varied and fairly sparse shrub layer. It is the loss of this shrub layer, inevitably cleared on farms, that is one of the causes of their demise. Their life history is one of the most well-known of any Australian bird, a result of extensive colour-banding studies carried out in the 1970s and 80s. HANZAB (Handbook of Australian, NZ and Antarctic Birds) deals with this comprehensively. 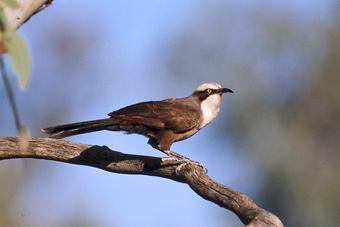 Like the other babblers they live in family groups, usually from about four to twelve in number, comprised of an adult pair and their progeny. In this species, adults can easily be distinguished by their pale yellow eyes, a character not attained until nearly four years of age. Young birds have brown eyes. 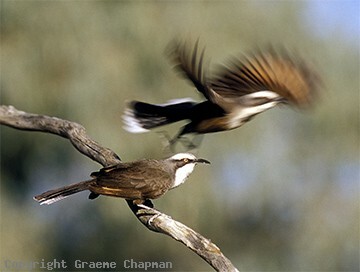 There are two distinct subspecies - the nominate one which inhabits eastern Australia and a Red-breasted form (see under Red-breasted Babbler) which occurs in northern and Western Australia. 443001 ... Grey-crowned Babbler, adult has yellow eyes. 443004 ... Immature has dark eyes.